a new forecast from International Data Corp. (IDC). An interview with the former Apple K–12 systems engineer, who will participate in multiple sessions during ISTE. THE Journal: What do you think about virtual reality (VR) and augmented reality (AR) in the classroom? Is the cost point for VR prohibitive? In virtual reality, one of my favorite apps is CoSpaces. It allows anyone to design a 3D space, and then interact with it in virtual reality. Virtual reality can be quite affordable with Google Cardboard. We can get into basic interaction in VR with Cardboard. There are 40 or 50 VR apps where you can simply use Cardboard and explore. Google Street View allows you to do virtual viewing of many different locations. That technology augments what the teacher is doing. Watching lectures at increased speed? Discussion in ‘Medical Students – MD‘ started by kimbosliced, Dec 24, 2010. Books can be places for intellectual wandering. They can also be mined of precious information with ruthless efficiency. the introduction of Overcast, a podcast-playback app designed by the creator of the text-bookmaking app Instapaper. One of Overcast’s key selling points is a feature called Smart Speed. Smart Speed isn’t about simply playing audio content at 150 or 200 percent of the standard rate; it instead tries to remove, algorithmically, the extraneous things that can bulk up the play time of audio content: dead air, pauses between sentences, intros and outros, that kind of thing. The study, conducted by adaptive learning provider Front Row Education, found that 75 percent of teachers use technology with students on a daily basis and that a bit more than half have a 1-to-1 ratio of devices to students in their classrooms (up 10 points from last year’s survey). That increase in student devices is helping to drive an increase in the use of technology, with about 60 percent of teachers surveyed saying they expect to increase the use of technology in the 2016–2017 school year. first: link to the Hospital Center, but not to the study; difficult to check the facts, which are discussed in the editorial. then the author jumps from one issue to another: mindfulness or contemplative computing, but h/she has no clue about these issues also. the research, which claims that social media (which is not social media, but more like BYOD + texting) has a negative impact on academic performance is no different the research that shows very positive impact of learning with social media. It is NOT about social media, it is about how it is used (methodology). Join Mario Callegaro, Senior Survey Research Scientist at Google UK, and one of own survey research scientists, Sarah Cho, on February 24 at 10 am PT / 1 pm ET for our webinar, Market research surveys gone mobile: Optimizing for better results. .My notes from the Webinar. 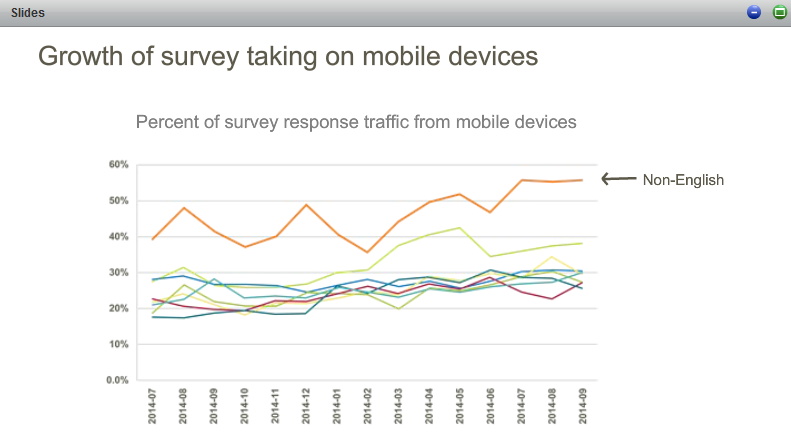 survey design device vs. survey take device – mismatch. When there is a mismatch, questions are asked. multiple choice: ok to use, but keep wording short, format response vertically instead of horizontally.